As I am about to open my new supplies boutique (this is happening tomorrow, remember? 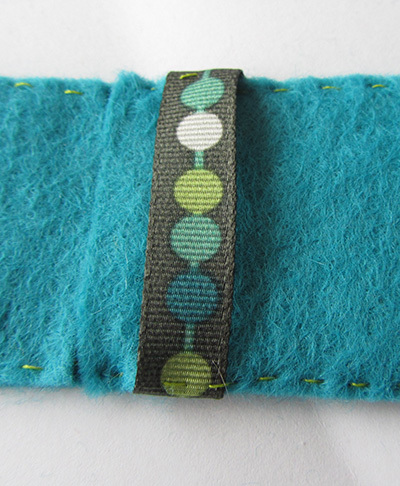 ), I thought I would celebrate with a series of 3 easy sewing projects using felt. 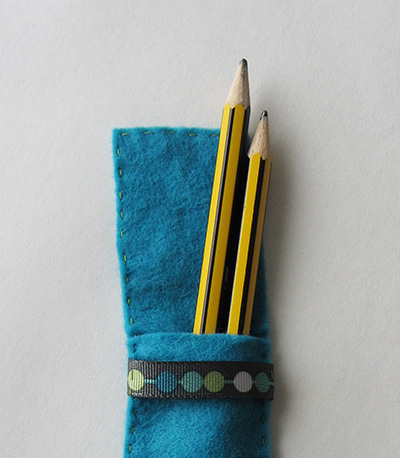 Here is the first instalment: the quick and easy pencil case. This simply designed case can accommodate two to three pencils and would fit in most (hand)bags. 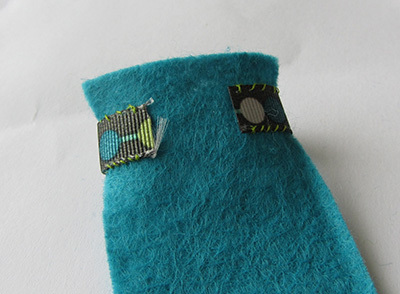 It is made of three pieces of felt and some ribbon. It can usually be completed within one hour. Let’s have a look at the steps to make this pencil case. Three pieces of felt: 4x23cm (1 1/2”x9”) ; 4x17cm (1 1/2”x6 3/4”) ; 4x6cm (1 1/2”x2 3/8”). 6cm (2 1/2”) of ribbon. 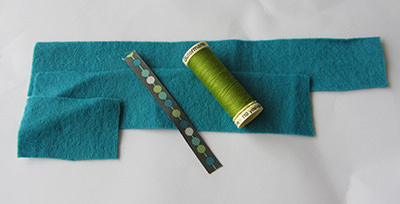 1 – Pin the smaller felt piece on one of the larger piece ends and make a running stitch on both longer sides and top smaller side (as shown on picture 1). 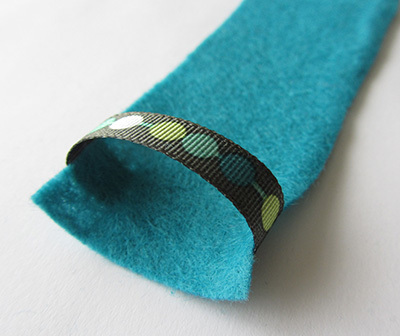 2 – Pin the ribbon close to one end of the medium size felt piece. 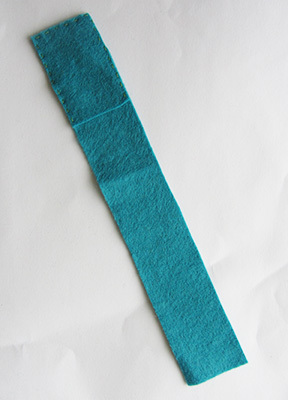 Fold the ends over and stitch on the wrong side to secure ribbon on felt. Look at pictures 2.1 and 2.2 for more information. 3 – Pin the medium felt piece on the larger one, filling the space left empty and ribbon facing up. 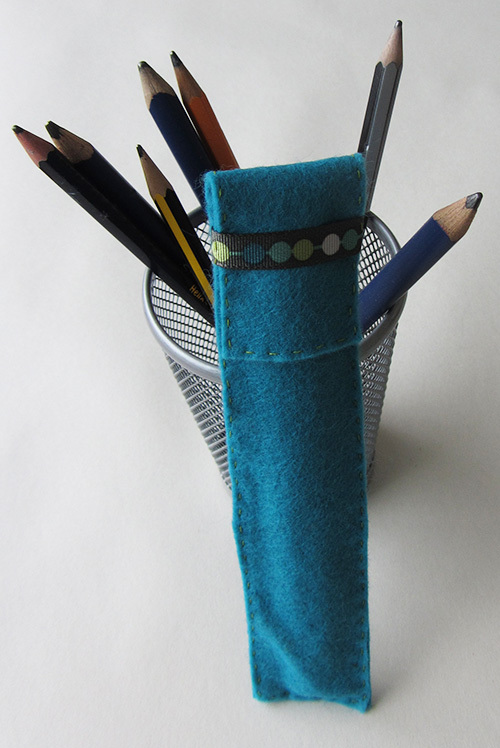 Make a running stitch along both longer sides and bottom smaller side to assemble both layers of the pencil case. See pictures 3.1 and 3.2. Here you go, you have made a pencil case! Stay tuned for two more quick and easy felt project, next one to be posted next Monday. Next Post La Creature Boutique is now open! Only deserved I can assure you!